This afternoon, in her suite at the Beverly Hilton, on the day before the Grammys, Whitney Houston passed away. Whitney Houston was an astonishingly gifted singer with a voice that has never been equalled. I’ve loved her voice since I was a kid, and her debut album, “Whitney Houston” was released in 1985. I wore that tape out. She went on to become an international superstar, and even took on the silver screen. Though she was always more talented in song than with acting, her talent and stardom always helped make the films she was in a success. Along with the tremendous highs of her career, there were excruciating lows – a troubled and abusive marriage, drug use, and erratic behavior cast a shadow on the once brilliant star’s reputation. I had always hoped she would overcome her tumultuous personal struggles and emerge the weathered but triumphant diva I knew she was. When I learned of her death, I was without words. 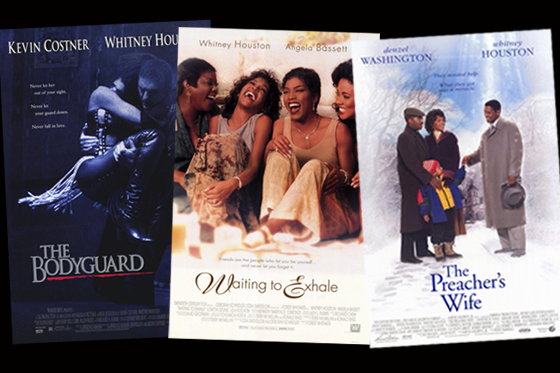 Tonight, we watched all the feature films Whitney Houston starred in. I wanted to remember Whitney for the awesome talent she was and just see her for the beautiful woman I remembered her as. In 1992, Whitney co-starred in a movie called “The Bodyguard” with Kevin Costner. Both were in their career primes, and although the film received mixed reviews, it was a box office hit. The single “I Will Always Love You“, a Dolly Parton song that Houston covered for the film, hit #1 on Billboard’s Hot 100 List and stayed there for a record breaking 14 weeks. The soundtrack is one of the top 10 best-selling albums of all time. In 1995, she co-starred with Angela Bassett, Loretta Devine, and Lela Rochon in the film “Waiting to Exhale“. It was another box office success and the soundtrack debuted at No. 1, and was certified 7× Platinum in the United States. Entertainment Weekly named it one of the Top 100 Movie Soundtracks. In 1996, Houston starred in the holiday dramedy “The Preacher’s Wife“, with Denzel Washington. While it was not the box office smash of her two previous films, it was successful, and earned her an NAACP award for Outstanding Actress in a Motion Picture. The soundtrack became the largest selling gospel album of all time. Although she had many ups and downs in her career and personal life, and was criticized by many in her later years, Whitney Houston was a beautiful woman with a truly amazing gift. The world was certainly a brighter place with her magnificent voice in it, and I am deeply saddened to see her light extinguished. I, along with many, many others, will always love you, Whitney.